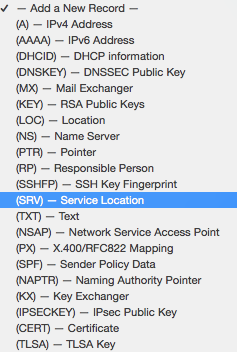 To properly route messages, Microsoft Lync requires you to set up two SRV records within your DNS configuration. 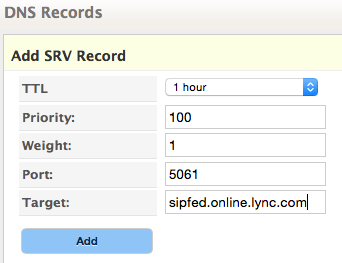 Follow these steps to create the necessary SRV records. NOTE: This guide is for a standard setup of Lync. For more complex setups, please reference Microsoft’s documentation or contact tech support. 1. Log in to your Managed DNS account. 2. Select Manage beside the domain you wish add the records. 3. In the Add a New Node field, create a new node called “_tls” and click Add Node. 4. Within the new node, create another node called “_sip”. 5. 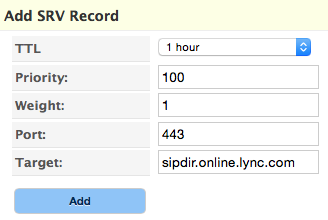 Within the “_sip” node, select SRV from the Add a New Record drop-down menu. 8. Return to the zone editor for your zone’s apex (your domain) and create new node call “_tcp” and then click Add Node. 9.Within the “_tcp” node, create a second new node called “_sipfederationtls” and click Add Node. 12. Click Review Changes and Publish.